IFSC Regulated Forex Broker, JustForex is offering a real hot 100% Deposit Bonus in classic or NDD trading accounts. Deposit at least 100 USD and receive 100 USD bonus straight. Moreover, profits can be withdrawn at any time; the bonus will not be removed when you make a withdrawal of profits! You will receive 100% Bonus for every deposit that you make, and the total bonus you can receive is up to 20,000 USD! JustForex bonus also supports the margin and can be used for maintaining open positions. This is the type of Deposit bonuses that are desired by many Forex traders. JustForex Hot Forex bonus is flexible as well; you are free to choose the amount of Bonus you’d like to receive. Register your personal account at JustForex Broker, make a deposit of at least $100 in Classic or NDD account and apply for the 100% bonus. Minimum deposit to apply for the bonus is 100$. You have 3 months in order to complete the necessary number of lots to withdraw the bonus amount. Orders closed with less than 3 pips are not considered in lot calculation. 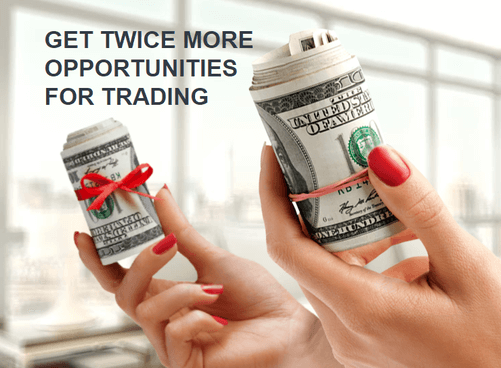 Get JustForex Double Bonus Now!